Words spoken hundreds of times as Captain Horatio Sinbad, a modern day swashbuckler born at least 250 years too late, steers his dauntless hermaphrodite brig, Meka II, into battle. Caught up at an early age in the daring do of the pirates and privateers, Long John Silver, Douglas Fairbanks Jr., and Errol Flynn to name a few, Captain Sinbad has been pursuing high seas adventure his whole life. He built the Meka II in his backyard in Detroit, Michigan, starting when he was 19. He launched her in 1967 and spent his summers cruising the Great Lakes. In 1970 he was turned loose on the high seas escaping the Great Lakes via the St. Lawrence Seaway and has pursued one seagoing adventure after another even managing to raise four children along the way. 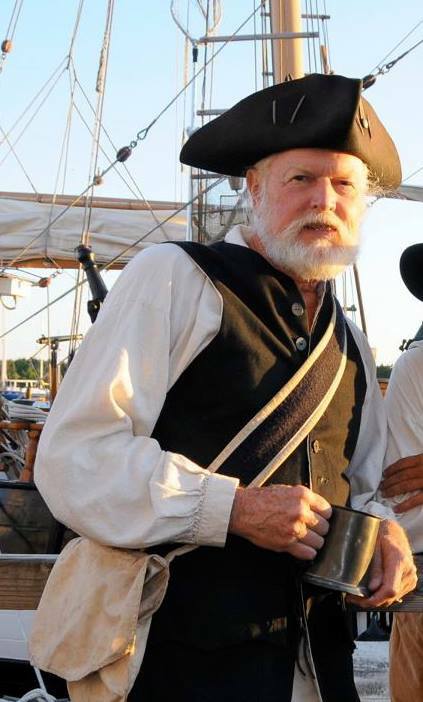 To keep his magnificent obsession going, he has been a draftsman, boat builder, restaurant owner, charter boat captain, commercial boat operator, sailing school operator, re-enactor, and pirate merchant. Recently he has used his sword less and his pen more to pursue a life long passion of writing and has published his first book. Captain Sinbad, a real merchant adventurer, has lived aboard continuously for over five decades making Beaufort, NC his homeport. If you are there look for the Meka II anchored in Gallants’ Channel. But then again you might not find him in port. Another adventure always awaits just over the horizon. 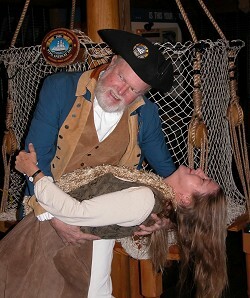 Captain Sinbad and Terry Brown with other crew members continue to be active participants in reenactments of historical context and tall ship events throughout the East Coast, Bahamas, Jamaica and Cayman Islands, and Canada.